The Imitation Game - HOW DOES ENIGMA WORK? After Arthur Scherbius died, in 1929, his Enigma-making company changed hands. By 1933, after the German Army had acquired the rights to make the encryption machine, the manufacturing company’s name became Heimsoeth and Rinke. 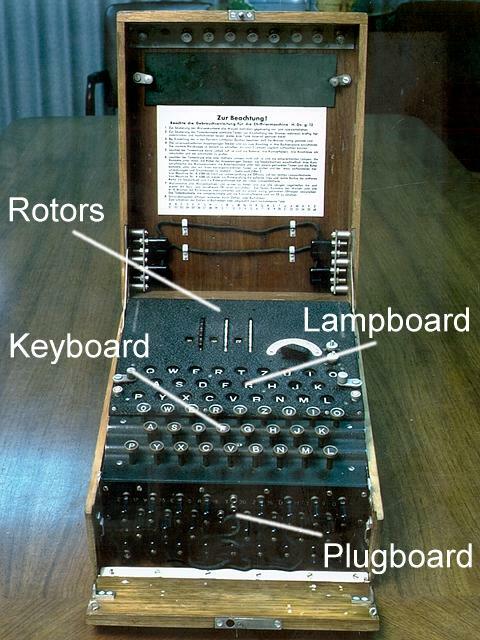 Although it was still a machine resembling a typewriter, Enigma was now more portable than its earlier models. It also had more rotors - those toothed wheels which were integral to Enigma’s success - which its operators could use. What were those rotors? How did they work? Why did the Germans think Enigma’s rotor-produced codes were unbreakable? Let’s begin by answering the last question. Hitler believed his version of the Engima was unbreakable because the chances for a human to break its codes were 150 million million million to one. That’s not a typo. Actually, to be even more precise, the chance of a human deciphering an Engima-generated encryption was nearly 159 million million million to one. In order to understand what Germany was up to, decoders needed to understand the Enigma machine itself. They got a head start when a new military Enigma device spent a weekend in the hands of Polish decoders in the late 1920s. By 1932, three Poles - Marian Rejewski, Jerzy Rozycki and Henryk Zygalski - had made great strides toward understanding Enigma’s make up. All spoke fluent German, were mathematicians and had completed a cryptology course offered by the Polish Cipher Bureau. With ingenious analysis and insights, they were able to reverse-engineer Enigma. With help from a German traitor - Hans-Thilo Schmidt, known by the code name Asche - who sold Enigma instruction manuals to a Frenchman (who then passed on those instruction manuals to the Poles), Rejewski and his colleagues worked-out how Enigma was wired and how it operated. They even produced replicas of the machine itself, including its rotors. In this Numberphile video, featuring an actual German Enigma machine, Dr. James Grime demonstrates those rotors, the machine in which those rotors function and the many configurations which Enigma operators could use to send encrypted messages. Rotors were toothed wheels which could be changed whenever needed. German Enigma-operators would change the wheels every day, at midnight. For code breakers who were unable to decipher messages on any particular day, all the hours of work on that day were lost because different rotors would be used the following day. Because of the rotors, the original letter typed on the keyboard would change seven times during Enigma’s operational process before that original letter became the final transposed encrypted letter. When the transposed letter was selected, it lit-up on another Enigma keyboard (known as the lamp board). Once the dispatch was fully encrypted, using this process letter by letter, the transmitting operator used Morse Code to send the coded message in groups of five letters. Enigma could also decode. When an encoded message was received, the same rotors would be in place on the decoding machine, and the process would work in reverse to reach the original letter. A key to Enigma’s unbreakable status was this fact: A single letter - for example “A” - was never used more than once in the coded message. This meant that a code breaker could not find a pattern while trying to break the encryption. Bos, Carole "HOW DOES ENIGMA WORK?" AwesomeStories.com. Dec 31, 2014. Apr 18, 2019. If the Odds against an Action are Next-to-Impossible, Why Undertake the Action? To What Extent Do Human Actions Enhance Computer-Based Inquiries?